Holy Baptism as full initiation into Christ’s Body, the Church. We believe it is a gift of unmerited grace, and therefore we offer it to babies, children and adults. Since infants and children cannot make the baptismal promises for themselves, we ask the parents and godparents to make these promises on their behalf with the understanding that as children grow into more mature young people they can confirm these promises for themselves. Holy Baptism is always a joyful celebration at St. Peter’s, and we mark these special occasions with gifts of special candles and home-made banners for each of the newly baptized. Whether they are old enough to realize it or not, each new Christian is embraced by God, and by our congregation, and marked as Christ’s own, forever! 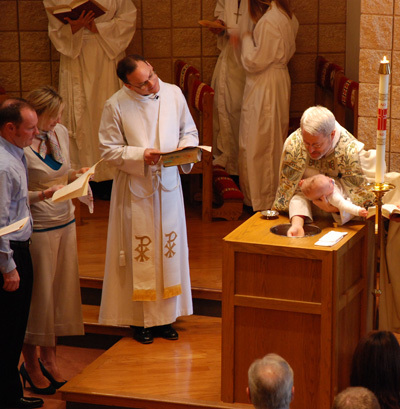 The Sacrament of Holy Baptism is offered several times during the year. Regular occasions include the Feast of our Lord’s Baptism (early January), the Easter Vigil (Saturday night before Easter Day), the Feast of Pentecost (50 days after Easter), All Saint’s Sunday (1st Sunday in November), and during the annual visitation of our Bishop (scheduled six months in advance). We offer classes to help prepare adult candidates, and the parents and godparents of infants and children for this important sacrament and occasion. If you (or your child) would like to be baptized at St. Peter’s, please contact the priest at least four weeks in advance of one of these planned celebrations and indicate your interest so that we can assist you in making the necessary preparations.